Ghost light: a memoir. · One Book. One Author. One Hour. Notes on front and back endpapers concerning the childhood of the author, his parents' divorce, his mother's unhappy second marriage, his volatile stepfather, the numerous schools he attended as a child, the author's personality, his early work in the theatre, the political activity of his family, lists of family members, colleagues, and other individuals associated to the author and a list of plays. Annotations by Brian Lamb in the margins and underlining of pertinent phrases throughout the book. 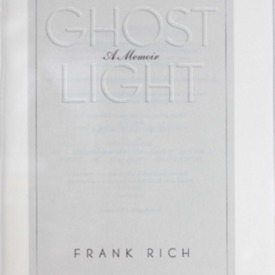 Rich, Frank, “Ghost light: a memoir.,” One Book. One Author. One Hour., accessed April 24, 2019, http://booknotes.gmu.edu/items/show/729. Rich grew up in the small-townish Washington, D.C., of the 1950s and early '60s, a place where conformity seemed the key to happiness for a young boy who alwasys felt different. When Rich was seven years old, his parents separated. Bouncing from school to school and increasingly lonely, Rich became terrified of the dark and the uncertainty of his future. But there was one thing in his life that made him sublimely happy; the Broadway theater. -- Jacket.